Up to 14 people can enjoy the stunning views from the roof top deck on this 5 BR 4 BA, pet friendly home just one block from the ocean in Bethany Beach on 4th St. The home is spacious and well outfitted for a large family or group of friends to enjoy a full or part week at the ocean. Pick up the boardwalk and stroll just 4 blocks to downtown Bethany where you can enjoy all the restaurants, shopping and family friendly environment. The minimum age to book this property is 25. Pets require an additional fee, typically $200 per week, per dog or $50 per weekend. Please request approval based on your pet's type and breed. The fee will be added to your balance after you pay your initial deposit. Please bring your own linens, towels, spices, oils, paper and plastic goods, i.e. paper towels, napkins, toilet paper, garbage bags, salt, pepper and oils. The kitchen is well equipped with all necessary appliances, dishes, glass and silverware as well as serving dishes, etc. We recommend Gale Force Rentals in Ocean View if you'd like to rent linens and towels. They deliver and pick up. 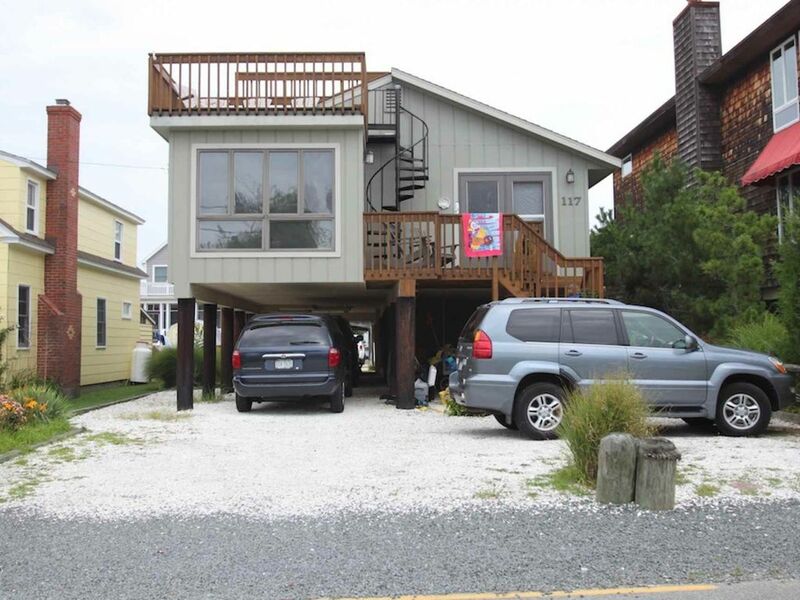 This casual, comfortable home is located in Bethany Beach 1 block from the Atlantic Ocean and the guarded beach. It features a long list of amenities including a roof top deck with a great view, 2 Satellite TVs with Dish Network 200 channels plus 10 Showtime & 8 HBO channels. Central Air. Wood burning fireplace. Outdoor shower. Covered parking. The main living area features an open kitchen and three sitting areas. Great for large families or groups. The grill is a charcoal grill. You will need to bring or purchase coals. Our family of seven has been coming to this house five years running. While it's not as spectacular in appearance or amenities as other nearby homes, its prime location (less than a block to the beach), accommodation of dogs, and plentiful parking is a huge plus for our four-car, two-dog family. This year we stayed for two weeks instead of our usual one week visit, and we'll probably be back next year, too. Jeremy is very responsive, the house is comfortable, and you just can't beat the location if you have to bring your dog on vacation with you! We had a very nice week here with family. Town is bustling with many choices, and about a :15 walk away. The beach was very nice, pretty close, about ten minutes. Must pay for parking in town, but we rarely took the car. Home was fine, with a well-stocked kitchen, and good air conditioning during a very hot July week. A top floor porch to look around, and an outdoor shower and foot-hose. Would stay here again; the July 4 fireworks were just great with our close seat. Beach got crowded/busy, but could still find a spot. All in all we really loved this house. It was spacious enough to accommodate our large family and really well equipped. The beach and town were a short walk. Our only problem was that on the first day we noticed that the dishwasher was not working. We contacted our iTrip contact Jeremy (who was awesome) to report the problem. He contacted the owner who was supposed to get back to us to triage the issue. He never called us and we never had a working dishwasher. That's not cool considering the number of people we had in the home. We were finally notified on our last day of vacation that a repair service was coming. I was really disappointed. For what we paid, I expected at least better communication from the owner. This would be a 5 star rating if it weren't for this issue. We just had a great week at Bethany and found the house had everything we needed. From the photos, things look a bit dated but the interior was nicer than expected. Plenty of room for the 2 families on the trip, and the single floor layout worked well to keep an eye on the littlest ones. My only complaints are the soft beds (by the end of the week our backs were killing us) and the lack of room darkening blinds in the bedrooms. We were a family group of 3 generations, age range 23-83. We also had our 2 family dogs with us. This home was great for us. The grandparents did fine on the stairs to the home. Everyone loved being so close to the beach and town. We walked everywhere. There was plenty of parking. Inside the home we had lots of room to spread out and feel comfortable- we were not on top of each other. The kitchen, dining and living area is open and spacious. There is everything you need and then some for any and all cooking you might want to do. We opened the windows and enjoyed the ocean breeze and the cool evenings. It was great to be able to bring our family dogs- they are mature and settled and just enjoy being with the family. We hope to have another family reunion at the beach and would definitely stay here again. Great location, lots of beds, working A/C, great rooftop deck and plenty of space for eating/watching tv. Everything's a little older in the home, but you're right next to the beach. Thank you for considering the wonderful Delaware Shores area for your next beach vacation. There are many wonderful locations to consider when vacationing in this 30 mile stretch of beaches including Rehoboth and Dewey Beach, Lewes, Fenwick, and Bethany. We have some of the most beautiful white sand beaches in the mid-Atlantic, where you can soak up the beautiful summer sun. There are long boardwalks, state parks, a resort, beautiful homes, awesome hotels, great stores, and restaurants ranging from pizza, burgers, candy, ice cream, and salt water taffy, to world class gourmet. Activities abound for all ages ranging from bicycling to fishing, golf, tennis, kayaking, boating, amusement parks and sightseeing, sunset walks, nightlife and more. And for shopping fans, the area boasts one of the largest collection of outlet stores in the country and it’s all tax free! So whether you're looking for peace, quiet and solitude or non-stop fun and action, we've got you covered. The Delaware Shores are an easy drive from many areas. Washington DC is two hours away, New York is four hours, Baltimore is two hours, Northern Virginia is three hours, New Jersey is three hours, and many parts of Pennsylvania are only three to four hours away. We are closer than you may have thought. Welcome to the Delaware Shores! Major Credit Cards Accepted. Monthly rates show the rental amount of a four week trip. A 50% deposit is required upon confirmation of all reservations. A $55 limited damage waiver will be applied to all bookings in lieu of a security deposit. Local, State & Federal Taxes 6%. Processing Fee $100 per trip.